The video above is a time lapse of a one and a half hour Peacework wall session i did that has been condensed into a 90 second clip. There’s a 30 minute version and audio download guiding you through a session is available within the TriBreath member area in the Healing category. It’s the first of three positions that i’m going to share with you. It’s very interesting to see how the body moves through its discomfort. If you have a keen eye, note how my left shoulder is held at the beginning and how the chest and shoulders sit when i come out of the session. Without any thought of what “one is going to get”, and only being there to observe and support the body even if the body appears broken, is indeed a different mind set. i always imagine Julie Andrews in the Sound of Music running over the hills with arms wide open ready to embrace. And that’s exactly what i believe is required for your body, and my body to heal. No thought of getting healthy, getting rid of this disease or getting the pain to go away… just giving! 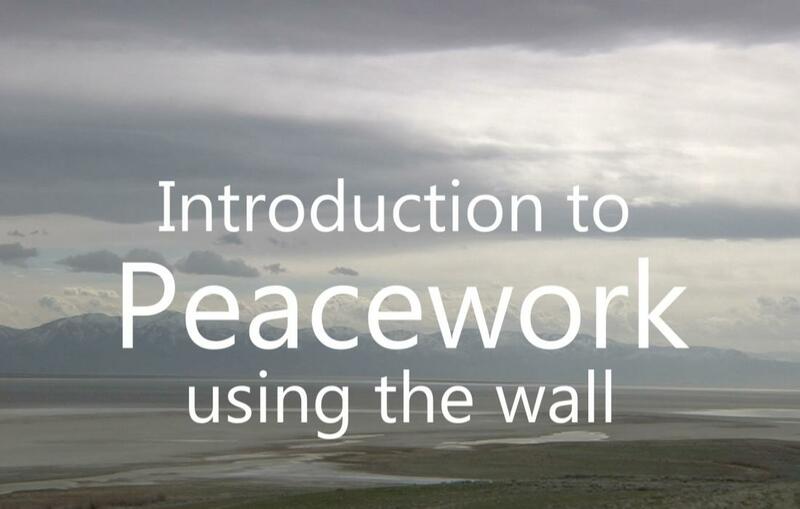 The term “Peacework” is very appropriate for this type of healing work. Everything on planet Earth changes form. Even rock turns to sand given time! So too the same laws apply to organic matter with the ancient chronicles calling this process Harmony through Destruction! Take for instance a seed! For the seed to experience life in the light of day, the shell of the seed must first be destroyed. Once moisture (the waters of our emotion) softens and helps disintegrate the shell (just like the rock), the seedling must then break through the “soils of darkness” to reach the light of the sun. And i believe it’s the same with us humans! We too must deal with our darkness to experience light. And this is where Peacework is most valuable. Imagine every illness, injury, destructive thought has an electrical charge. The body; made of matter (it has density) is the cell for this charge. Any experience we experience that has a charge outside of what we call the “soul realm” (peace, love, harmony, goodness, beauty, truth, joy) the body holds as a charge. This charge could be the pain we experienced falling off a bike as a child. It could be the scolding we received when we found a trinket and held it close to our heart that was taken away by the shop keeper when we were a bubba. It could be the loss we experienced when the one we love say’s, “i don’t love you”. The amount of memories and experiences we live through in life that don’t bring us joy (speaking for oneself) is infinite. i believe any experience that is outside the “love realm” is held as a charge by the body as only the body has “physical matter”. This charge makes itself manifest through many diverse avenues of reflection. It may be called illness. It may be called injury! What is interesting is what it’s called or “what is wrong” doesn’t really matter. Because how this charge makes itself apparent in the truth of it is irrelevant. What does matter is how one relates to the charge. Once we realise there is nothing wrong, and all there is is a charge that needs to be embraced and brought into alignment with the oneness of the soul, ALL obstacles disintegrate. All illness… All injury… All discomfort! By releasing oneself of judgement of what is wrong is one of the biggest portals to peace and wisdom. Knowing and integrating oneself as infinitely connected to “all that is” could well be the path to walk if one wishes the ability to walk on water. Once belief is no longer and knowing is embraced, physical matter (which is 99.99999999% empty space anyway) becomes the playground of the adept. It is connecting with the truth (the knowing) that there is nothing wrong with your body, that i believe, is the true path to healing. With that said, also know this… 15 years a go i broke my back! Had it not been for my beautiful partner and a friend carrying me up to the house from the base of the mountain, i am sure i would have died from shock and hypothermia. It was messy!!! Mind you it was also the true birth of TriBreath as i used my breath to stitch up my back in my mind as i lay paralysed flat on my back. Those who know me know my back has collapsed many, many times over these years and some of those times have been brutal pain! Yet here i am now in my 50’s after 7 years of recognising what Peacework is moving better than i did when i was a kid… true! Please know that over these seven years some of my sessions are over two hours long and more. With that said, i have been practicing the art of meditation since my uncle introduced me to it at the age of 13 on the front lawn in Sydney Australia. Yet the whole concept of what meditation truly can be (mediation with the soul) only started taking form 7 years ago when i was in my early forties. What i’m basically sharing with you is it’s not about the time. It’s your intention that matters! Starting with 10 minutes and building up is better than not starting at all. Like i said above, there’s the same one and a half hour session that’s only been compressed down into a 30 minute video clip that slows down the body’s adjustments giving you greater insight as to how the body adjusts and expands. Download the audio that takes you through the connection points from your feet up of how to bring your body’s structure into alignment which is the true essence of Peacework. It’s the most wonderful work if regeneration is appealing to you. i wish you well and please let me know how you go.